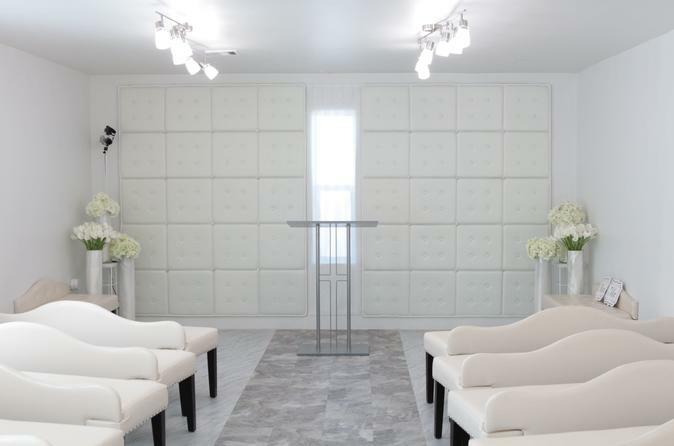 Get married in the Las Vegas Wedding Chapel that is known as "The Clean and Modern Chapel". Paradise Wedding Chapel is sleek and modern with a warm and welcoming feel. We have packages to suit just about any budget. We can also arrange for package add-ons to customize your Las Vegas Wedding Experience. Immediately upon entering Paradise Wedding Chapel, you will feel right at home. You will need to arrive with your Nevada Marriage License (if you are having a legal wedding). We will process your paperwork within a few minutes. You will be able to lounge in our "Living Room" on our sofas, by the fireplace, for a few minutes if you need to just chill a bit. A little bit of relaxation will help with any pre-wedding jitters! We encourage our guests to take photos in this room, as it is beautifully decorated and has many photo opportunities. We will then bring you and your guests to our one-of-a-kind Las Vegas Wedding Chapel. You'll be able to have someone walk you down the aisle, have bridesmaids and groomsmen, flower girl and ring bearer with any of these packages we offer. We have a beautiful bridal suite that can be added as an option if you prefer to get ready at the chapel.